A beauty dish uses a parabolic reflector with an obstacle in front to distribute light towards a focal point without a harsh centre highlight. The light created is between that of a direct flash and a softbox, hence giving the subject a wrapped, contrasty look. In fashion photography the beauty dish is also responsible for the characteristic round catch light in the subject's eyes, and it is one of the indispensable items in the standard studio. The use of a beauty dish isn't just confined to fashion though, and it is one of various studio photography techniques that we can borrow for use in macro photography. 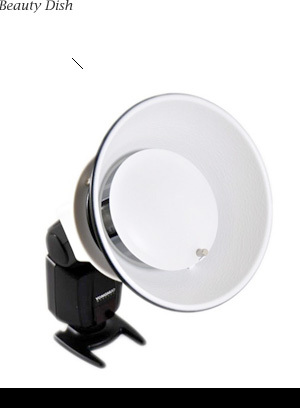 K-8 Flash beauty dish, part of a modular kit of flash accessories that also includes barn doors as an attachment. The dish is made of metal so a bit on the heavy side and mine doesn't always stay at an angle like the illustration. The light created by this beauty dish is between that of a direct flash and a softbox and gives a wrapped, contrasty light. The flatter the pan of the beauty dish, the quicker light falls off. Conversely, a perfectly hemispherical pan will create a well focused spot of light but coming from a lot of directions, ie 'wrapping' your subject. It is worth paying careful attention to how far away from the specimen you place the beauty dish - placing it close produces a liquid wrap effect. Further away give you a more soothing light and loses some of the hot spots that you might see if too close. The light falloff can also be controlled by adjusting flash distance and using grids. If you want to produce even more controlled lighting from your beauty dish, add a honeycomb grid, and for a more diffused variant, fit diffusion material in front. Although similarly shaped to a ring flash, a ring flash is a direct, linear-directional source with hard light that emanates straight from the source. A beauty dish on the other hand is an indirect parabolic source from which light beams converge at a focused point, creating a perfect balance of hard and soft light. The light is even and feathered at the edges but a ringflash doesn't feather at all. Feathering can be very handy to give even light to parts of a specimen which are different distances away from the light source. In other words, at the edges where the light starts to fall off, use that to light something nearby, but use straight on light to light something further away. The beauty of this is that they both get the same strength light, rather than the front one being brighter than the back one. I have used beauty dishes for both studio stacks and field macro. An aluminium frozen food container with a hole cut through it, sitting on the end of the flash, covered with thin tracing paper and a blocker facing the flash, makes a reasonable diffuser for use with a top down flash. The thing to be aware of is that the blockage pane actually needs to be bigger than you might initially suspect. For a bigger beauty dish, use a chicken roasting pan and beat it into a hemisphere shape. There are a lot of diy options for making a beauty dish: a cheap Weber disposable BBQ charcoal thing makes a good parabola and a piece cut out of an old CD makes a good hotspot blocker. You might not want to just limit yourself to metallic materials though as metallic materials seem to give a harsher falloff than white. Small salad bowls are also a perfectly splendid way to make a half way decent beauty dish for extreme macro use. Cut a hole in the centre through which the flash pokes, and use a metal reflective material to shape the block. The ideal, I think, would be a white plastic hemisphere as the parabola, with a highly reflective metallic material as the block. If so inclined, it would not be difficult to make and shape your own beauty dish by using moldable plastic to make the parabolic reflector. Moldable plastic is lightweight and you could quite easily paint an inner surface white to do so.